I just got back from my latest trip to Palm Beach, and looking back it was one of my most adventurous and fun yet. There were some minor “this-would-only-ever-happen-to-Lydia-as-she-travels-alone” sort of scenarios…you can read more at the very end of this post for your entertainment. All of those things aside— the palm trees were beautiful, the trunk show was so much fun, and I love everyone in Palm Beach! My only complaint is that I’m not tan enough! The Skinny Dip so graciously hosted me for a trunk show of my artwork, stationery, wrapping paper, and art prints! If you’re looking for something effortlessly so Palm Beach, look no farther. 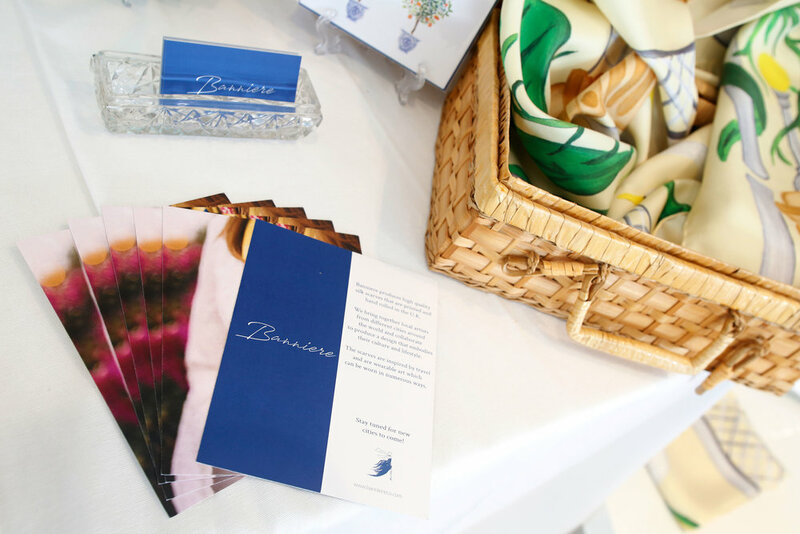 For this event I teamed up with my friend, Olivia, who owns and runs Banniere. She has already been working with the Skinny Dip at their various locations, and for this event she was launching her brand new Boston scarf! Olivia works with different artists from all around the world to produce scenes from the beautiful cities and your favorite locations. She works with a factory in London which prints and hand rolls these stunning silk scarves just for you! With an eye on capturing the essence of a place and culture and simultaneously ensuring the artwork translates beautifully to silk and wearability, Olivia’s line is sure to impress you. And pair it with one of her effortless silk dresses and voila, mon amie!- the women who launched a thousand ships will be looking right back at you from the other side of the mirror! Olivia is such a beautiful and lovely person inside and out to be around, I just loved being able to set up shop beside her and swoon over her scarves! She embodies the elegance of that 1960s silk scarf feeling with big sunglasses. I was also thrilled to work with Beau & Ro for this event. The founder of the company of Beau & Ro is actually one fo the founders of the Skinny Dip Collective as well. I’ve been following her for some time and was thrilled to be able to work with her. We offered customers live customization of their leather purchase in store. You can see some of the pieces I worked on in the shop in the photos above. Featuring all Palm Beach inspired scenes and work, it was such a delight to work on these truly luxurious bags. My great thanks to The Skinny Dip Palm Beach staff, Ivy, Lindsey, and Leigh for setting up such a lovely event. And to Olivia, Sara, and all our customers who came by to support us. I hope you’ll drop in the next time you’re in Palm Beach and see my collection and shop all the amazing brands available to you! It will certainly not disappoint!! Did it have a spare tire? No. Please, don’t be plebeian. Mini coopers of this size do not come with spare tires. Waited for three hours for tow truck to come. Spent half an hour on the phone with my insurance company getting transferred from company to company with no answrers. Tow Truck towed me 10 miles to Mini Cooper dealership- waited for 2 hours to hear anything (because- WOW. Palm Beach BMW is doing great right now) who estimated this was going to cost just under a grand to fix. GREAT. Called owner. Thank GOD, owner said he’d pay for it. So when I planned on arriving at 11 at the trunk show with coffee and croissants for everyone- I didn’t arrive until 4 in the afternoon with no coffee and completely drained of any bibles that I had previously. Day = lost. And did I get money back, no. No, I did not. Do I think 'I’ll hear back from the parent company? No, no I don’t. I turned on the light and went to go move some papers that had been rustling and found myself staring into a very white and very confused—- NO. Not ghost—- FROG. HE GOT INTO THE BAG. I then proceeded to hold it at arms length as I rushed towards the door -which felt like it was a half mile away from my room- and put him safely in his natural habitat. I kid you not. This was all real.